I’ve been thinking about a lot of things lately. In the midst of not blogging for a week, taking some time to reset my priorities, I found that I couldn’t turn off the part of my brain that was trying to wrap itself around all of the questions of food and eating and mindfulness; mentally, I was blogging anyway, or at least trying to. I still took a little time to read others’ blogs and articles, too — always learning, that’s me. In some ways, it’s possibly worse for me, sanity-wise, to NOT blog, because then I’m not giving voice to all the stuff that wants to come out. One very important realization came to me, though, during those seven days or so of “time off” from the blog; and J. and I have been talking it through somewhat carefully, examining the evidence, looking at it from all angles before deciding what to do. We’ve realized that this business of trying to be more conscious eaters and feeders of our children is a multi-level journey, which we can choose to arrest at any point. There are gradations of conscious eating just as there are of almost any other philosophical or ideological practice in the world. There are those who swear off any and all processed food, to the extent that they won’t even eat commercially milled flour or grains of any type; there are those who eat exclusively locavore diets; there are those for whom conscious eating extends only as far as taping a list of the “Dirty Dozen” to their refrigerators and buying Annie’s mac and cheese instead of Kraft. It’s all a matter of individual principles and comfort level. For many people, though, it IS a journey, not a single plateau, and J. and I feel as though we’re ready to take another small step down the road. One of the things I’ve talked about quite a bit over the past few months is this idea of affordability — quantitative value vs. qualitative value. We still don’t have all the answers to that. But as we’ve been pushed closer and closer to the edge of being truly, deeply troubled by things like GMOs and staph-resistant bacteria in conventionally raised meats, we’ve started to see that it may no longer be a question of luxurious priorities that shapes where we shop and what we eat; it’s becoming a matter of firm belief that there IS no other way for us to be certain of doing our best to protect the kids’ health (and our own). I didn’t know if we could do it, truthfully, but I was damned determined that I’d give it the best shot I could. And surprisingly, even with a splurge of $18 worth of smoked salmon in the cart, and the purchase of two whole roasting chickens that weren’t needed this week, but which were on sale, we were EXACTLY at $200 when we got to the register. However, there’s no room for extras, we observed; while we plan to spend the rest of the spring and summer shopping as exclusively as possible at our farmer’s market and at Whole Foods, going to the large grocery only for very occasional selected purchases (like major deals on plain Cheerios or oats, or the great price they often have on a high-quality 2-lb. block of our favorite cheddar — which isn’t even carried at Whole Foods), we know that it will likely mean we have to stop doing something we’ve gotten all too accustomed to doing. We’ve become lazy and indulgent with ourselves and have started jaunting to the store for the odd trip during the week to pick up extras of this, or to replace a bit of that, when we see we’re running low. We find we’d like more of something in the house for whatever reason, and we pop out to get it, as long as it’s not a big expense. Unfortunately, that type of habit quickly adds up and could take us dangerously over our budget limits if we allow it to continue. With this new mindset, we’re having to adapt in ways I hadn’t considered, but I’m so glad that we are. Instead of buying tortillas and pita bread this week, though I knew we’d need both, I reached for the whole wheat flour in my pantry and made both from scratch. (Turns out that the extra effort is SO worth it — both were so far superior to market varieties that I don’t think I’d want to go back.) And tonight, with a planned “breakfast for dinner” on the menu but only 2 eggs in the refrigerator, I had to get very creative very quickly in order to avoid falling back into old patterns and going out for ingredients. We happened to have some organic sourdough bread in the house, which was rapidly going stale; and of course, our freezer wouldn’t be our freezer without a well-stocked drawer of frozen fruits and berries. It occurred to me that if we were really going to work in this new model of “making do,” we’d make something out of nothing, and that’s what we did. Who knew you could make a decent French toast dish with only two eggs? 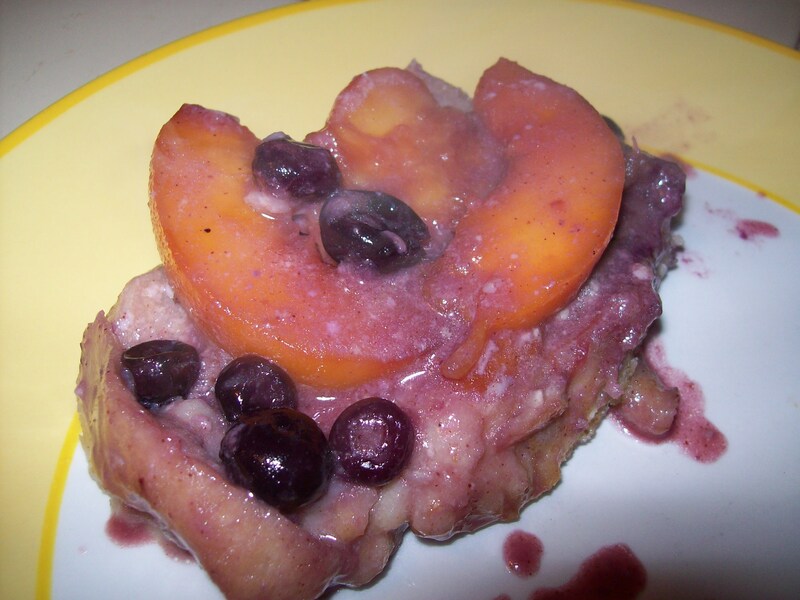 The resulting casserole, with so little egg in the custard vs. the ratio of other ingredients, was feathery-light; the bread itself almost became a silky custard to complement the fruit. We served a little nitrate-free uncured bacon alongside, and a platter of raw vegetables and fruits in case anyone wanted to nibble. But no one really did — we were too happy with our “humble” makeshift meal. It’s a new chapter in our adventure, this shift in our shopping habits and priorities, and I’m sure it won’t come without growing pains. We’ve already realized that we’re three days from a shopping trip and have run through all the eggs, yogurt, and nearly all the cheese in the house. But there’s a certain feeling of both physical and emotional satisfaction that comes from so carefully minding what we consume and how; and so much good to be done, I think, for our bodies and our bottom line. I’m looking forward to seeing what the next few months have to teach us. This entry was posted in Accountability, Cooking, Feeding kids, Food culture, Meal planning, Parenting and tagged baking, cooking, family, food, Household organization, leftovers, meal planning, milestones, parenting, recipes. Bookmark the permalink. FANTASTIC!!! I love to see this. I as well need to watch our budget, food is definately our biggest expenes after housing. I love to justify an organic chicken purchase by using your slow cooker stock recipe and knocking out 2-3 boxes of store bought chicken stock, replacing it with homemade. That’s like 6 bucks right there – nearly half the price of the chicken. If you haven’t already, check out Whole Foods bulk section. I think organic oats are way cheaper than packaged, even on sale. Also, they have great organic popcorn! We LOVE the Whole Foods bulk section! L. really likes going with me and picking things out — he has discovered that he loves wild rice after choosing it from the bins there, and he’s also tried all different kinds of dried fruits and nuts as well as bulgur, red lentils, and some other unusual things. And popcorn is absolutely one of our favorite snacks. This is exactly what I mean — you’ve really figured out how to justify the expenses by using ingredients carefully, stretching your dollar, and figuring out where the best values lie. Good for you! I think it’s a great point that if one is committed to buying the higher quality products…it’s actually cheaper at Whole Foods than the regular supermarket. I am going to take notes the next time I go shopping and then plan a trip to Whole Foods. I usually don’t go there as it’s a bit of a ride…but if I could consolidate all of my shopping into one trip it would probably actually be more cost effective than running out here and there to closer stores. Let me know how it works out for you. I know it may not be the same experience for everyone, but for us, it seems to be an option.